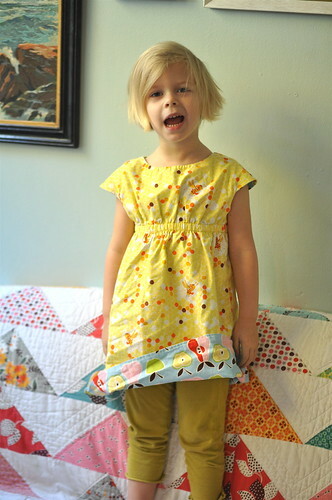 With wrinkles, because she wouldn’t wait for me to iron it before I put it on her. Nor would she let me comb her hair, so you get wrinky bedhead Kit today. I’ve been a busy bee, sewing and knitting a bunch of clothing for Kit. Some of it we have made up as we go along, but this dress is the totally adorable Roller Skate dress from Oliver + S. I own several of her patterns and love the details on them. 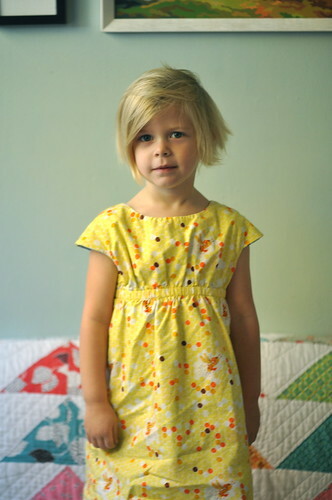 This dress is especially simple – only two pattern pieces for view A. I made it reversible by cutting out the dress and lining as suggested, but from two different prints Then I finished the hem by sewing the two pieces together, instead of having separate hems. The button is a fabric covered button that I made a few years ago. It was languishing in the button jar, so we pulled it out to put it to good use. I always forget how much I love these. I should make more of them. Kit loves this dress and asks for it by name. She loves that little bee. If only I could talk her into wearing the same kerchief on her head, it would be perfect! Especially for serious bedhead days like today. Ahem. Kit wanted to show you the other side. 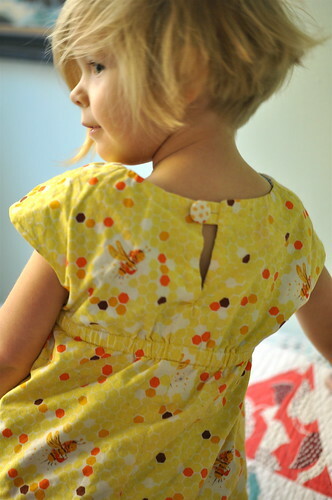 I need to attach one more button for the reverse view – she loves the pears and apples and can’t wait to show them off. I have had yardage of this print for a few years now, and it’s high time I used it. I made the size 3 and it’s a great fit for her – hopefully it will continue to be into the spring, since she’s a little peanut. For the winter, we’ll put a long sleeve knit shirt and leggings underneath, or throw a sweater over it so that it will get plenty of use all winter as well. We can use a little sunshine-y yellow once the rain and grey hits (which looks to be this weekend). And the best part? When she put on the dress, she hugged me tight and said “Mom, thank you so much for making this dress for me. I love it.” That’s what makes it all worthwhile. Love this new blog, I don’t know why I hadn’t visited you here before! Also, love, love, love Kit’s haircut. Super cute. Thanks Jess! I’m trying to make being here a new habit. Thanks Amy! I love dresses – one piece dressing for the win! onmygoodness, i could eat her up!! super cute dress 😉 great job, mama! Thanks Beki!! I think this would be a great dress for your younger girls too.